...and every other animal that has been displaced by the storm is on my agenda today but they do not need more volunteers, they do however need donations. Even a $5 donation will help. 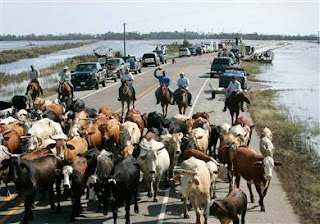 Over a thousand horses and cows have drowned but there are at least 15,000 still needing help. As far as helping animals over humans? Its no contest for me this time especially after seeing the behavior of people who feel they are owed a generator so they can have air conditioning to watch their daytime television!! You can live without television and air conditioning for a few days!! At least you have a house!! Help out someone that doesn't gripe the world owes them something because they got left behind in the storm!! Blondes are donating to the Redneck Education Fund! !